I don't use Polyvore that much anymore - but I thought it might be fun to create a style collage with my outfit photo today. Wait you won Smartwater for a year! I would love to win that! I love searching Polyvore for new outfit ideas, such a fun site! It was a great gift - I didn't have to buy water for a long time! OoooOo- I wanted to email you this weekend about polyvore and such. I think I will anyway because you are a graphic making magician. Have a great week! Please do! Thank you for thinking I am a graphic magician. Wow, do you look good in yellow!! So pretty and leopard shoe heaven!! Yellow is so pretty on you Lisa, love this look!! That's too funny about all that water! I cannot imagine that much water at my door! You are so good at the collages though. Love this combo. 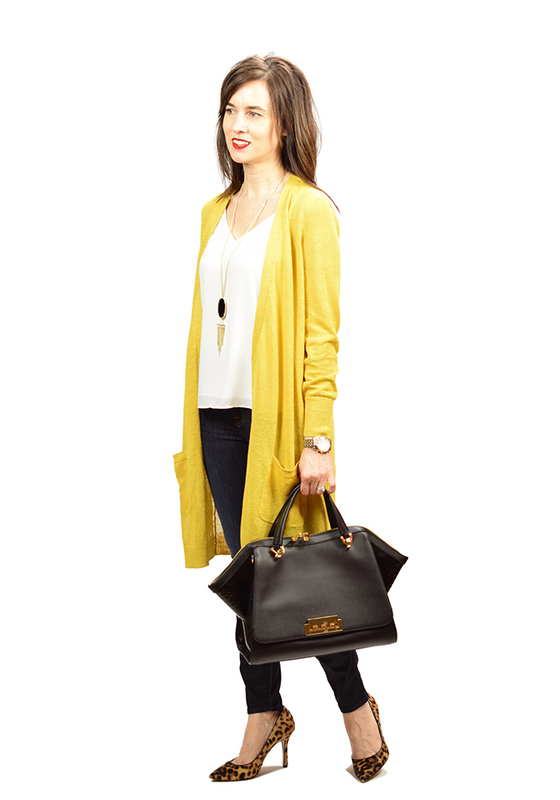 I don't know why I don't have a long cardi in my closet yet, but yours looks great and love the yellow on you! I love love long Cardigans! You look so fantastic and so chic! perfect for spring! Wow that is kind of neat that you won Smartwater for a year! Love the yellow and leopard combo. I need to pull out my leopard heels. Yours are fabulous! Wow, sounds like you won't go thirsty- haha, Great look by the way. Haha, you're poor delivery man having to deliver that must smart water...and where the heck did you store it?! I love the look! Those shoes, swoon. I love this yellow color and it looks great with leopard! !